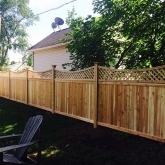 Does your Watertown property require fencing services? Roots Landscaping is able to provide quick and quality fencing to keep a scenic perimeter around your property. The Roots Landscaping team has completed a wide variety of fencing projects making it an area of expertise among all of our landscapers. All of our landscapers are equipped with the knowledge, gifted with the talent, and outfitted with the tools to setup professional fencing around your property. 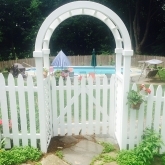 Landscapers of Roots Landscaping can help you decide on the perfect fence for your property. 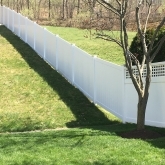 We are proud members of the American Fence Association, and are qualified professionals motivated to create the best fencing that will make your property stand out. Choosing on the right type of fencing can be difficult as there are many styles of fences to choose from. Before you even begin the selection process, you may want to ask yourself why you’re getting a fence in the first place. 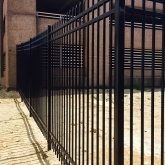 Residents typically get fencing for reasons pertaining to security and privacy. Additional reasons people choose to get fencing is due to concerns surrounding their children and/or pets. 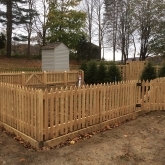 Regardless of the reason, Roots Landscaping is able to apply the proper fencing for your Bridgewater property at an affordable rate. 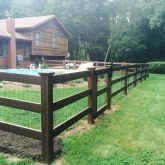 We have the best partners who provide quality fences. 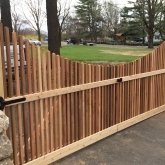 To learn more about our fencing products visit here. 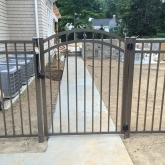 Roots Landscaping is able to install a variety of fences around your property. You can rely on Roots Landscaping to deliver a quality fencing job every time. It is important you employ professionals to apply fencing to your property. Fencing of unsatisfactory quality will not stand a chance against environmental forces and essentially results in money wasted. Contact a Roots Landscaping representative to set up an appointment to schedule an assessment for fencing suitable to be placed around your property. Once we are settled on the assessment process, we then begin conducting measurements around your property where the fencing project will take place. Price of the fencing project is determined by the height of the fence, fence material, as well as the length the fence. If you have a fence that simply needs repairing, Roots Landscaping can restore your fence to full operability. Roots landscapers are the most knowledgeable and experienced individuals when it comes to applying and repairing fencing. A common problem most wood fences experience is wood rot. This is when fungus spreads to wood and eats away at it, which causes it to decompose or rot. To counteract wood rot it needs to be chemically treated, patched, then re-painted or stained. Sometimes wood rot can become so bad on a section of fencing that it ultimately needs to be replaced. When it comes to wood rot, Roots Landscaping can easily repair or replace your wood fence that is experiencing rot. Additionally, fence poles serve to create structural stability but can naturally shift over time. Without proper maintenance of these poles it can result in great damage to your fence. To maintain the longevity of your fence, it is advised you replace or repair your fence poles. Depending on the material of your fence, it can experience holes and cracks over time. The procedure for repairing holes and cracks also depends on the material of your fence. We repair any holes and cracks in your fence by filling them in. This keeps your fence in the best condition and prevents further damage. Another result of wear-and-tear of fences are missing boards or collapsed sections of fences. Depending on the severity and material of the sections where boards are collapsed and missing is what determines the repair process. Contact a Roots Landscaping professional today to learn more about how we can help fix any problems your fence is experiencing. Roots Landscaping is Watertown’s trusted landscaping company. We are here to answer any questions you may have about fencing around your property. Whether you are unsure about the type of fencing you need, how the fencing process works or just need a quote, contact Roots Landscaping today. Additionally, we offer professional services in masonry and landscaping services. Call now to request our landscaping services: (203)-304-7326.